There are currently over 50 Brand Names of pianos worldwide. Our professional local and long distance piano moving service has you in mind. 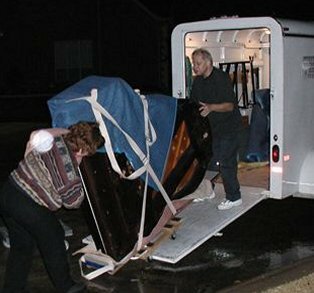 Whether it's moving a piano upstairs, across town, or across the country, our service is piano moving with the utmost care. If you would like to request a quote for moving a piano, we will ask a few questions and prepair a quick professional quote. If you're relocating or having home remodeling/repairs performed, don't risk damaging your piano. Let us store your upright or grand piano in our climate-controlled storage facility. Pianos should be tuned AT LEAST twice each year. Since the piano is made of wood, it is affected by local changes in climate. Humidity fluctuations result in swelling and contracting of the wood, which lead to constant increases and decreases in wire tension. The tension or pitch changes is what affects the general tuning of the piano. To keep the piano in tune, proper wire tension must be consistently maintained. Ideally, pianos should be tuned to concert pitch or A440. This means that "A" above middle "C" on the keyboard should vibrate at 440 cycles per second. If you don't have your piano tuned regularly, say a few years go by since your last tuning, the pitch can drop so much that it may take multiple tunings to bring it back to the correct pitch and to stabilize the strings. If you would like to schedule a service for a tuning, it includes a pitch raise and tuning to A-440, cleaning, adjustment of the pedals, minor repairs or regulation. We provide general repair such as voicing, regulation and replacement of piano parts. Sometimes the repair can be done on-site in conjunction with a tuning. If you are interested in restoring an antique piano, our restoration service specializes in taking pianos that have lost their original beauty, tone, and finish, and bringing them back to life.